At last, some good weather! Finally, I have cut my willow. I wouldn’t normally have left it this late, but it’s been so difficult to get on the ground in this rain. Neither do I have the right space to store too much greenwood; so it’s really important that my raw materials are in tip-top condition to keep, if I’m not going to use them right away. These considerations bring to mind two issues: good materials; and seasonality. I grow different varieties of willow, each of which is a basketry type: Salix purpurea “Dicky Meadows”; Salix purpurea “Lancashire Dicks”; Salix triandra “French”; Salix daphnoides “Continental Purple” and Salix alba vitelina “Britzensis”. Here is the first wonderful thing about willow. 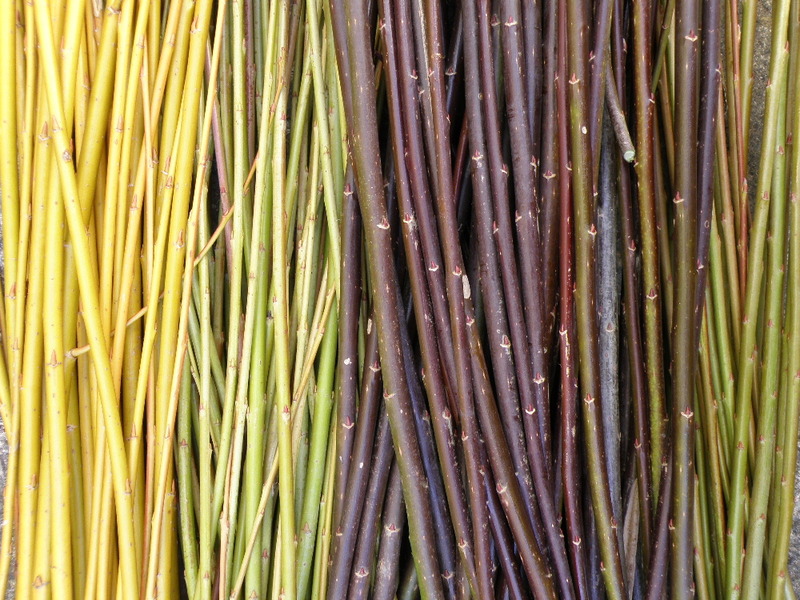 Many varieties produce great rods for basketry – good for their long, slender, straight rods with strong skin, and with flat, close-growing buds. In Britain there are eighteen native willow species and twenty-seven interspecific hybrids (Brendell 1985:2). The second wonderful thing about willow is that it is fabulously successful at reproducing. There is widespread hybridisation, it flowers and seeds, and it will “strike”; push a 9″ stick of willow into the ground in early Spring, and it will root and grow for you. Following on from willow’s strong inclination to expand its tribe is its determination to keep on growing. Cut back some willow, and return next year to see how well it has come on! Be amazed at all the straight rods growing out of the treetop where a branch has fallen away in a storm! I imagine that it would take no more than a season to realise how easy, and how valuable, it is to manage willow to grow really useful products; from basketry rods to fence- and building-sized poles on pollarded trees. Which brings me to seasonality. It’s time to cut the basketry rods once all the leaves have fallen off. This is usually from November. The rods are then a season old, good and straight with no branching, the buds are small and flat, the leaves have fallen naturally. You can continue to cut over the Winter, until the sap has started to rise again, when the buds on the rods will start to push on. As long as you can keep your harvested rods cool and dry (beware mould and frost), you don’t have to use them right away. They change from “greens” = unseasoned rods, to “browns” = seasoned rods. All it takes is the right amount of soaking and damping when you need them, and you can make baskets with your browns any time of the year. So if you do want to store your rods, this has an impact on the building space that you need. The right space for storage, the right space for soaking and mellowing, the right space for working (although working space is the least demanding). Which is another way of saying that it was not necessary in the past for life to be entirely governed by the seasons, given planning and preparation. Last year, however, the lack of frosts meant that my plants still had leaves well into December. Then it seemed that it would never stop raining. If I had cut my rods a few weeks ago, I would have risked loosing the lot to rot in storage. As it is, I was only just in time, as you’ll see from the photos (the buds, especially towards the tips, were starting to sprout). The photos also suggest another wonderful thing about willow, the beautiful range of bark colours. What the pictures can’t convey, however, is the last wonderful characteristic of willow that I want to highlight. The fabulously spicy, salty, aromatic smell. This post is the second in an occasional series called “Weird and Wonderful”. As part of the process of learning about the characteristics of willow, I carved a large scoop from some of the River Kennet wood that I used to make the bowl in my earlier blog post. The orange colours have been brought out by the raw cold-pressed linseed oil that I used on the wood. 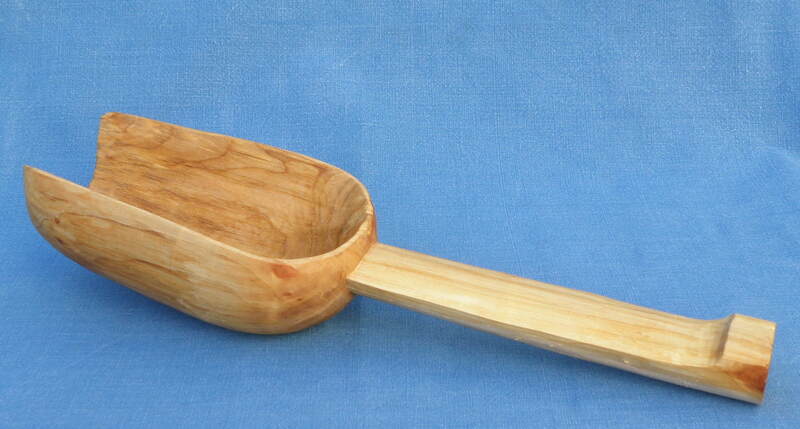 It’s about 32cm long (bowl about 15 cm, handle about 17cm). It’s all one piece of wood, carved from half a log. The back of the scoop’s bowl was at the outside of the log. 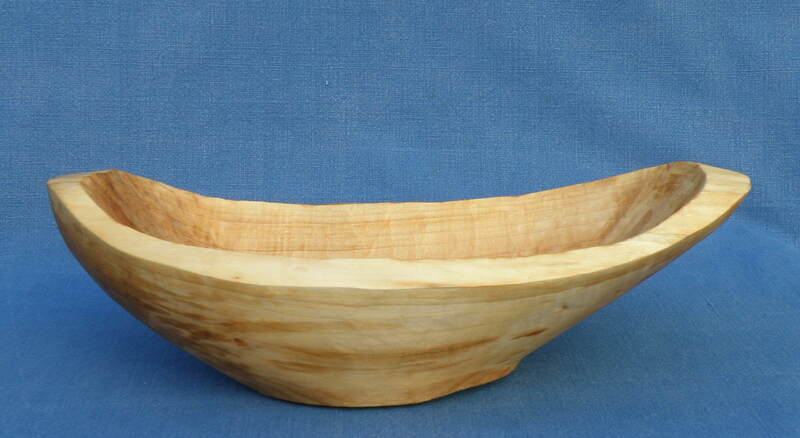 Just like the bowl I wrote about earlier, the cleanest cuts were those across the grain. The smoothest surface is the outside of the bowl. The handle surface isn’t bad either, except where some fibres were lifted by the cutting edge and tore out. Cutting parallel to the grain was very difficult to manage. Even the thinnest of fibres lifted up on the handle, and when I tried to cut or scrape these off, others would lift in the opposite direction. The interior of the bowl also presented problems. This was because of the steep sides and relatively sharp angle between the sides and the base. The willow fibres tended to lift or crush in this area. Although the upper internal sides of the bowl are quite smooth, the lower sides and base are noticeably rougher. The narrowness of the bowl meant that I could not place my hands correctly to get the direction of cut I really wanted with my spoon knives. Perhaps this would have been easier if I had left-handed spoon knives as well as right-handed. The wood is still relatively green, having been cut about this time last year. I shall have to leave what I have left for some time before seeing how it cuts when well-seasoned. In the meantime, perhaps I need to read about how willow is managed for making cricket bats, and whether the different British willow varieties have noticeably different qualities for wood-working.